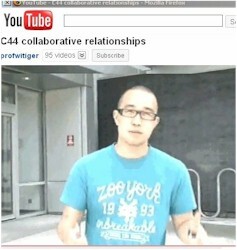 In 2009, Kenway Du and friends put together a very humourous video that actually explains well the various forms of Collaborative Relationships - they got a big pile of class participation marks for doing this, and my respect for coming up with an innovative way to explain something that was important for students to understand. INTRODUCTION In the Unit "Why Companies Export: Reasons for going International" we looked at whether it is best to be Proactive or Reactive. Now, we will take a closer look at the various types of arrangements that can be created to allow a company to be international. Almost all of the ways that a company does business overseas involves some collaboration. Experience has shown that it is less expensive and more productive to have some degree of co-operation with companies and government in the host country. or, subtitled "reasons why companies get involved in complicated ways with other companies"
AKA "focusing on what you do best"
horizontal links are also developed for projects that are too large for one company, such as giant sized civil engineering projects such as railways, airports, hydro dams etc. Using the old MGTC44 text, plus other texts, plus the course instructor's experience, here is a list of what we would describe as the "Major Ways to get involved in International Business" some texts refer to the term "Different Modes of Entry"
Regarding the list to the left, some of these ways involve collaboration, some do not. The majority of the "Ways to get involved in Intl Business" involve co-operation and collaboration in our increasingly competitive and "globalized" world. "The U.S. State Department is investigating how aircraft engines made near Montreal ended up in attack helicopters in China. The maker, Pratt and Whitney Canada, says it did nothing illegal. It delivered 10 engines to Bejing in 2001 and 2002 on condition they be used only in civilian aircraft. " CBC added "But Washington is not happy. If the engines contain U.S. technology or parts, the company could be hit with big fines for violating U.S. export laws. 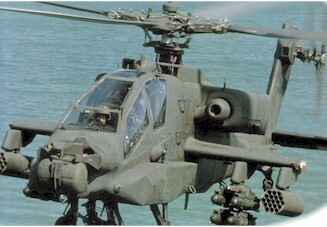 It has been confirmed that the Chinese military put the Canadian engines in Z-10 attack helicopters"
military analyst Richard Fisher explains that "the Z-10 attack helicopters is just one major military program, amongst hundreds, that China is pursuing in order to prepare for a possible war against Taiwan". CBC says "Under U.S. arms trafficking laws, Washington must give its approval for U.S. products and technology to be used for military purposes in a third country." Japan's Mazda is transferring technology to DDM Plastics of Tilsonburg, Ontario, to enable it to manufacture front end module carriers for the Mazda 6. Mazda started using module carrier technology in Japan earlier this year  as it reduces the time and cost of automobile production. DDM Plastics is a subsidiary of Daikyo and Mitsui and Co. of Japan. Calgary-based Nova Chemicals Corporation and Kubota Corporation of Japan announced that they reached an agreement under which Nova Chemicals will license its new ANK400 anti-coking technology to Kubota. The Japanese company will manufacture and globally market the product to ethylene facilities for gas feedstock cracking applications. ANK400 is a new anti-coking furnace tube product that increases on-stream time for ethylene furnaces..
a good way to spread your brand without taking the risk of buying real estate and setting up foreign operations. there are risks when the contract manufacturer does not produce to a quality level which meets the customer expectations, or when their are flaws in the production which could cause danger to users of the final assembled product..
sometimes the contract is just for real estate, erecting the building, and installing the machinery - other times it also includes hiring the local personnel as well. 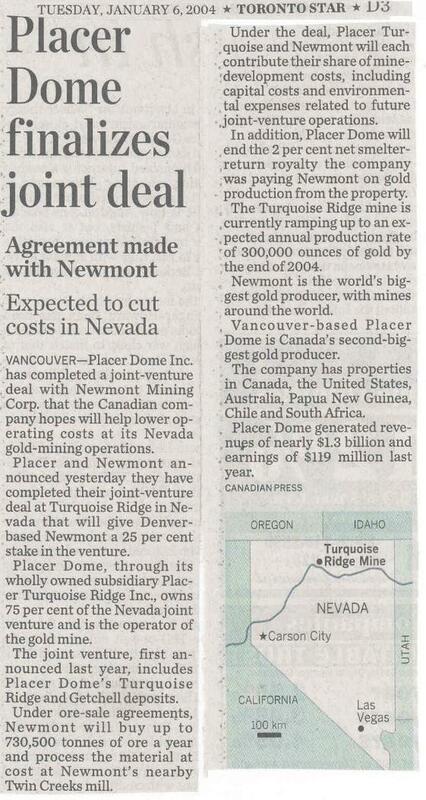 Example of an equity joint venture is the JV that Canadian mining company Placer Dome has with Newmont Mining - the result will help lower operating costs at their Nevada gold-mining operations. 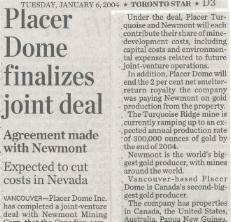 Placer Dome Turquoise Ridge Inc.
Mitsubishi Electric Corporation has joined the G.729 Consortium, supported by the privately owned Canadian Sipro Lab Telecom Corporation, which works to protect intellectual property rights and promote standardization of technologies. The G.729 Consortium provides the telecommunications industry with a low bit rate speech coding solution within the field of digital audio compression. Mitsubishi joins major players, France Telecom, Universite de Sherbrooke, and Nippon Telegraph and Telephone Corporation, in incorporating G.729 into its electrical and electronic equipment. POINTS The difference between alliances and consortiums is that consortiums are usually created for a specific short term project, whereas alliances can take place over many years and involve multiple aspects of the relationship whereas consortiums usually are arranged for one specific topic or project. Student Jessica L. in MGSC44 in July 2014 found an example of a consortium in I.T..
best idea or not, but if successful, there are trillions of dollars to be made worldwide, which would only make the competition between large transnational companies more intense." WTGR replies. "I think this is an interesting concept, but the premise of "Connectivity across multiple operating systems" may go against some of the monopoly situations that some hardware and software companies have been trying to leverage - so some of the super big companies might not co-operate"
Student Bhavana G. in MGTC44 in March 2005 found an example of a consortium which we have noted below. Bhavana emailed Prof. Richardson and said "..i found an interesting article on the internet today about constoriums and Toys R Us. I know we were talking about them in class yesterday so I thought you might want to read the article and/or add it to your website as and example of a consortium." 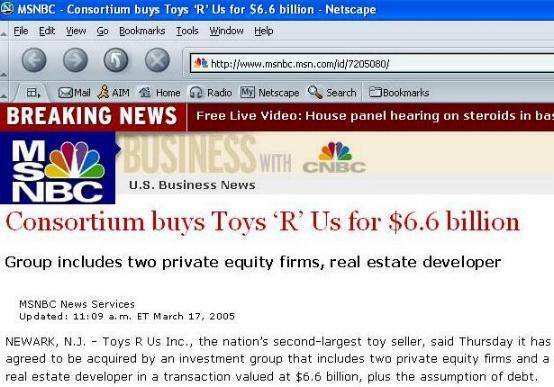 While this story did not explain the reason why this consortium bought Toys 'R' Us, there are a number of plausible guesses - they may be speculating on the chance they can sell the inventory at mark-down prices and make a tiny profit, they might want to split the company up into several divisions and sell them off to competitors in the toy business, or maybe some analyst has calculated that the real estate owned by the 681 stores could be valuable sold off to developers. A good example of a company very diversified into many lines of business through collaborative strategies. Alfa shows that companies can use several types of collaborative strategies to exploit int'l opportunities. 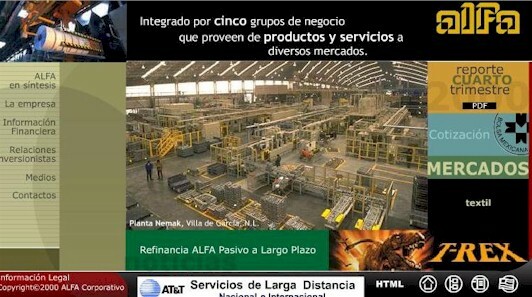 This is a screen capture from Alpha's website - which is mostly in Spanish. 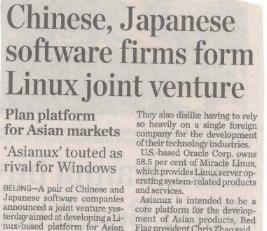 When we first started discussing this company in C44, in 2003, they had no English content on their site. Terza (a Shaw, Alfa JV) is the largest producer of carpets and rugs in Mexico and Latin America. Alfa also has a relationship with a U.S. rug mfg. "In addition to its U.S. operations, Shaw Industries maintains a manufacturing presence in Mexico. In June 1994, in conjunction with Grupo Industrial Alfa, S.A.de C.V., Shaw Industries established a joint venture for the manufacture and marketing of carpets, rugs, and related products in Mexico, known as Tenedora Terza, S.A.de C.V."
So, sometimes Alfa makes an alliance for its strategic purposes, and sometimes, as in the case of Shaw, it ends up in an alliance because it is sought out by a company looking for a strong local partner. The relationship not only benefited Alfa, but also turned Shaw into the largest carpet maker in the world. - updated, in 2004, Shaw was bought by Warren E. Buffett and is now a subsidiary of Berkshire Hathaway, Inc.